The 6 Idahoans - me (on Dezzie), Connie (on cover boy DWA Saruq), Layne (on Harley), Shyla (on Doc), and Anne (on DWA Nadra) - with Commander Rose (Regina Rose, 12-time finisher of the Big Horn 100) headed to Wyoming for the Big Horn 100 with hopes for a clean-sweep finish. Only Layne had ridden and finished this ride before, a few years ago when she was caught up on the mountain in the dark in a storm where she almost froze to death before finding her way off the mountain to the finish line. 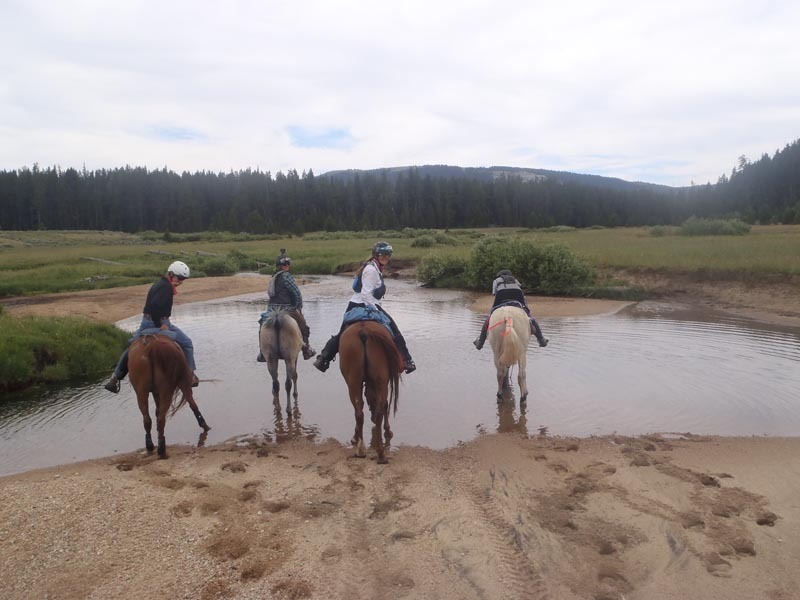 We'd all heard the stories of how tough the ride was (Regina provided us with plenty of tall tales from the good ol' days), so we were prepared for a doozer of a trail, with some fit and ready horses. But before we settled into the hot ridecamp in Shell, Wyoming, at the foot of the Big Horn mountains, we got to spend a couple of days in the lap of luxury with Regina's friends, Tom and Fawn, in their AIR CONDITIONED HOUSE, with SHOWERS and MORNING COFFEE WITH THE PRESS OF A BUTTON, where we heard even more entertaining tall ride tales. Regina was our Wonder Crew and Commander in Chief, and we did whatever she said. On Thursday she hauled us out to ride the first 8 miles of trail that we'd be zipping over in the dark, and she drove her trailer far up a sketchy road to pick us up. Since Regina remembers every single turn and bush and tree and fence line on that Big Horn trail, she told us what to watch out for over every few miles (as if we'd remember): "When you get up there past that hill (WHAT hill??? ), you'll see a clump of trees (there's trees everywhere!!! ), you skirt the edge of those trees, then turn right and go down that hill (WHAT hill???) and angle to your left (HOW FAR angle!?!?). There's this big rock (WHICH rock????) there that you can't miss, and…." etc. And - seriously - the way that woman can pack a sh*tload of crew gear for 4 people!!!!!!!!! (Shyla's husband and daughter came to crew for her, so they packed her stuff). And then unpack it and re-pack it at every vet check!!!! I still have not learned how to use those ratchet trucker straps, can't put them on nor get them off. Starting time came way too early Saturday morning - 4 AM - especially when my alarm didn't go off at the intended 3:00 AM and I woke at 3:08. 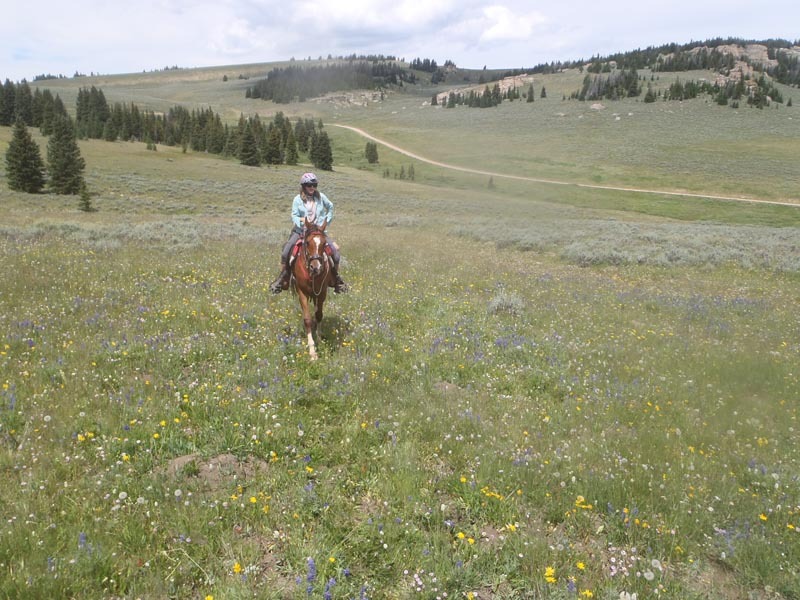 Connie and I popped right out of our sleeping bags and staggered up and into ride clothes and tried to fumble in the right directions of coffee and food and horse tack. 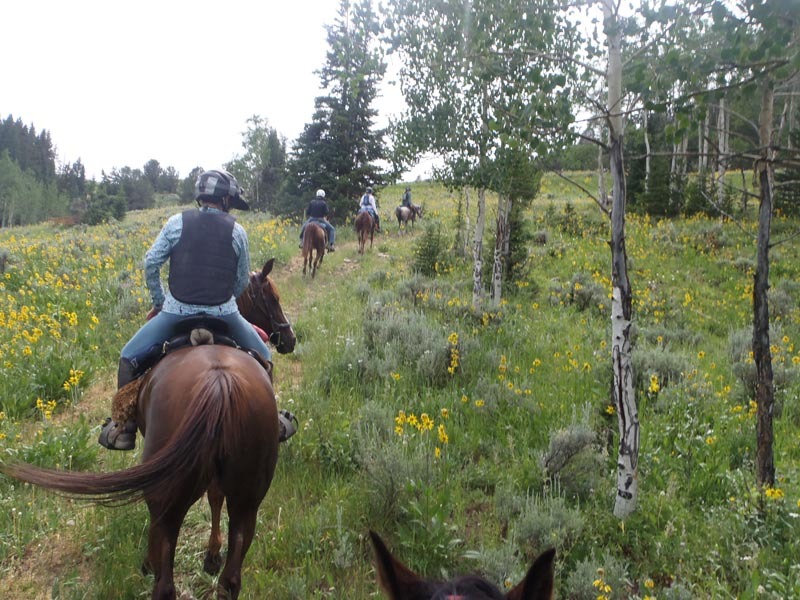 The start was smooth and efficient, and Dezzie found himself in the lead of our group, happily winging along at a smart clip like he'd been born for the Big Horn trail his whole life. We found ourselves right with the other Idahoan, Tom Noll (back for his 10th Big Horn ride), and that's how it stayed pretty much the entire ride. Dezzie led most of the way to the trot-by at 14 miles, where we all took a short break because, of course, Regina met us with water and horse food. Then we started heading up the Dugway into the mountains. Hitting this area at 6 AM - instead of 9 AM in the heat like the 50's did on Friday - was just perfect - good light for the spectacular scenery and cool air for the hard-working horses. It would be another 20 miles or so to the top of the mountain (after going way up and way down and way up and way down and…. you get it) for the first vet check at around 34 miles. Since we had all been sufficiently frightened about doing the Shag Nasty in the dark some 16 or so hours from now, we had plenty of Shag Nasty jokes to keep us entertained. It was at about mile 17ish when Dezzie did his own Shag Nasty. Power walking up the Dugway, one hind foot then the other stepped on a granite slickrock, and not one but both hind legs just slipped out from under him so that he ended up in a Shag Nasty Pistol Squat (said Layne), with both his hind legs splayed back. 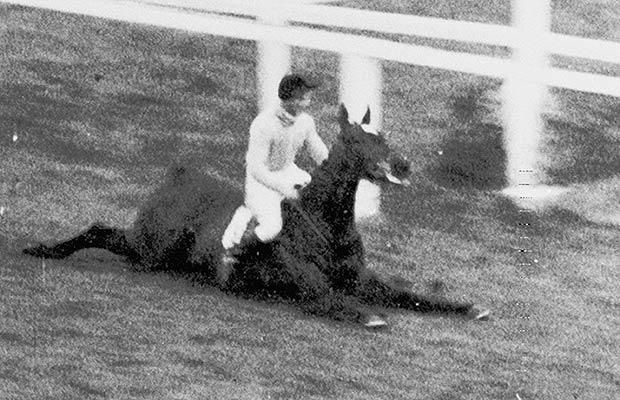 Dezzie had pulled off the perfect Devon Loch move (the Queen Mother's horse Devon Loch was about to win the 1956 Grand National Steeplechase, when he inexplicably leapt an imaginary fence 40 yards from the finish line and went down in a Shag Nasty squat on his belly, legs splayed - and lost the race before he could get up). I froze… should I leap off? Should I sit still???? Dezzie wasn't flailing, so I did not breathe nor move a muscle, and from behind, Connie watched as it took a tremendous effort for him to lift up and get his hind legs back up underneath him. He walked out of it fine, continued up and up and up the hill, and at the next trotting spot he felt just fine…. and we continued on. It did make me think of how far back in there on the trails that one could get, and then have a looooooong way to go and a possibly looooooooong wait if anybody got hurt. But then, we could all just sit on our couches where we are safe from crashes, and all have heart attacks instead, or a meteor fall out of the sky on our heads. So we might as well be out riding in the Big Horns! Once we got to the top of the Dugway…. it was back down and down, and back up and down and up and down. 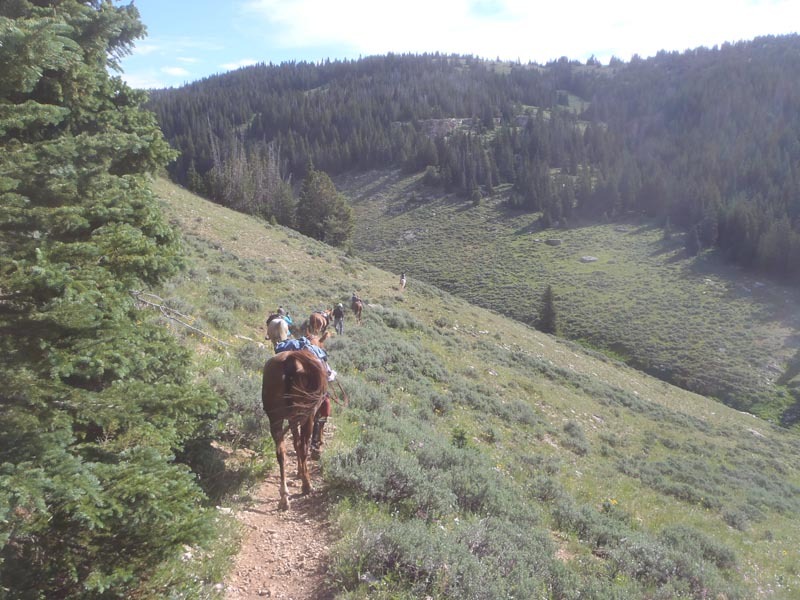 One of the canyons was one steep rocky climb down and one long hard steep rocky climb up, where all the horses had to take several breathers just walking up. We crossed fabulous meadows with showy wildflowers. The horses had plenty of grass to grab while walking, even wild alfalfa. The trail was excellently marked for this first loop… Cindy Collins gets the honor of riding and marking this one. We never had a question where to go, although we did have tour guide Tom Noll with us, and he knows the trail. When we 'topped out' on the mountain for the 3rd or 4th time, we actually recognized "that fence line" (and even recognized it from the opposite direction!) from the driving tour Regina had given us on Friday, and we knew we were really just a couple of miles from the first vet check. We flew along the two-track road up there and arrived a bit after 10 AM, right about the time Regina expected us (the cooler weather from starting earlier in the morning had helped us cruise right along). We made good time, as we were only an hour behind the leaders, Suzie Hayes (on Sandstormm) and Hannah Johnson (riding Stuart). The Idaho horses all looked great for their vet check. Dezzie's pulse was 52 (criteria 64) and he got all A's, and he ate the entire hour hold. Riders all felt pretty good too. Regina and Dennis and Jade had of course set the horse and human smorgasbord out for us, ready to walk up to and serve ourselves whatever we wanted. Next was down, down, down for miles, gentle downhill miles on the 2-track road to the highway crossing and ski area. Now, Dezzie is a powerful, effortless mover (and pretty - we call him a Breyer model), but one thing he is NOT, is smooth. Particularly downhill. Uphill - fine; flat - can be a bit rough; downhill - lordamercy. And it was miles and miles of LORDAMERCY, and we were all cruising, making up time for those walking miles ahead. My stirrups were half a hole too long, but that was better than half a hole too short, and I didn't want to drill another hole in Connie's saddle stirrup leathers. I'd had many training rides on Dezzie, and a 55-mile ride at City of Rocks last month, so I knew this position was the best choice. However, it took a lot of my energy to stay centered and balanced on this Big Mover, my feet were aching and going to sleep, and my left foot banging into the outside of the stirrup, none of which I could relieve no matter what I tried while flying along; and I was starting to think, hmm, we are at about 40 miles, and with 60 more miles to go on this horse I think I'm going to die before the finish line… and right about then, I thought I started feeling a little 'extra roughness' - that's how I can look back and describe it. At times I thought I felt Dezzie slightly off behind, then he definitely wasn't; the road was uneven, and he still felt powerful, and maybe he was a bit off in the left front, but then he definitely wasn't. Regina and Lynn Rigney and Dennis and Jade met us at a few places on the road to offer us water, and Dezzie felt fine each time we started off again trotting. But I kept thinking he was taking some slightly off steps. It was after we had a short steep rocky trail short-cut off and back to the road, where we walked, I told Connie I thought I felt something might be off, and when we got back onto the road, she followed and watched, and at the trot that time I immediately felt him off in the right hind. Regina met us once more before we climbed a big hill then dropped down another steep long one to the highway, and I told her my horse was off and I was pulling. Too bad, but I wouldn't consider trying to go another 60 miles on a horse that was not 100%, not even on an 'easy' 100 mile ride, and certainly not a hard mountain ride. If I had 5 miles to go, and had no choice but to handwork into the finish anyway, maybe he could have been finessed in, but that wasn't the case. Besides, I was close to a good stopping point where I could get a quicker trailer ride back to base camp. Connie and I cruised on the mile or so to the ski area (I didn't want her to get left behind from our group, I didn't want to try to handwalk an abandoned Dezzie to the ski area), and other than feeling just a bit rougher, Dezzie no longer felt off, but no way was I going to attempt the next 25 mile loop to the next vet check and hope everything would turn out all rosy. The trailer did indeed come just as the Idahoans headed off into the trees. Dezzie only had time to whinny a couple of times and not-quite-freak-out before I loaded him in the trailer and we pulled out. Regina had, of course, thought to hand off to me from her crew truck my backpack, some food and iced coffee :) :) :), since I'd be in basecamp till our riders hopefully got back from the finish line (from where they had to be hauled in to camp) in another 14 hours or so! Yes, sad I didn't finish the Big Horn 100, but not devastatingly sad, because I caught Dezzie's lameness very early and he will be fine, we got a quick and easy trailer ride back to camp, and I was not going to be physically beat up for another 60 miles and 14 or so hours and therefore be crawling in pain for the next several days. Plus, I was blessed with cloud cover and a strong breeze in base camp, so it was not excruciatingly hot like it had been the previous day. I also felt rather privileged to be in fairly elite company… AERC 1997 Pard'ners Award Winner (with Kootenai Zizzero, also 2011 AERC Hall of Fame horse) Suzie Hayes, who'd been in the lead leaving vet check 1, had decided her horse just did not feel quite right, and she turned around and came back to the vet check and pulled her horse. Suzie is one of my heroes, and if she can make a decision like that, for the good of her horse, and I can do the same thing, I must be on the right path to endurance enlightenment. 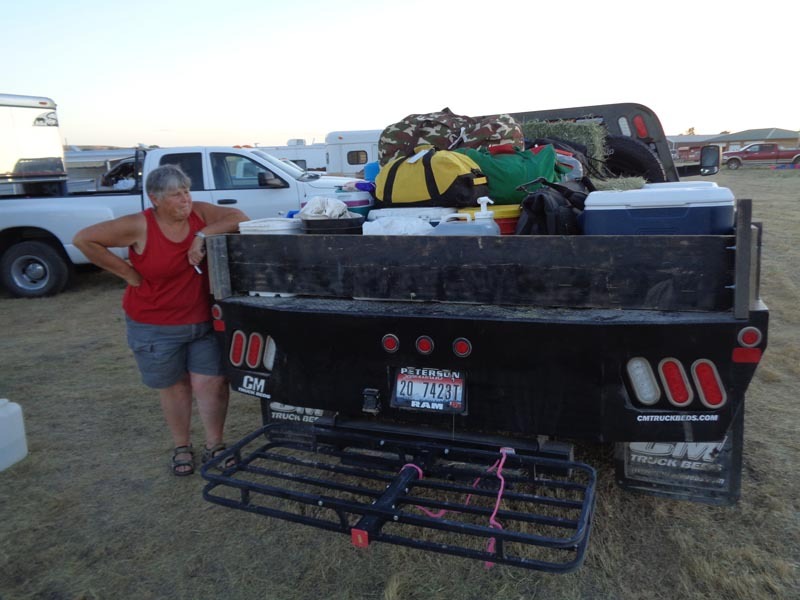 And so my ride ended, quite literally, because we had no news of anything, other than my Idaho peeps were still out on trail, till around 2 AM when I heard Layne arrive back at her trailer next door. She and Shyla had finished and had just been hauled back to base camp from the finish line, both wiped out after being barfing sick coming down the mountain, but they'd finished with Tom Noll. Yay! 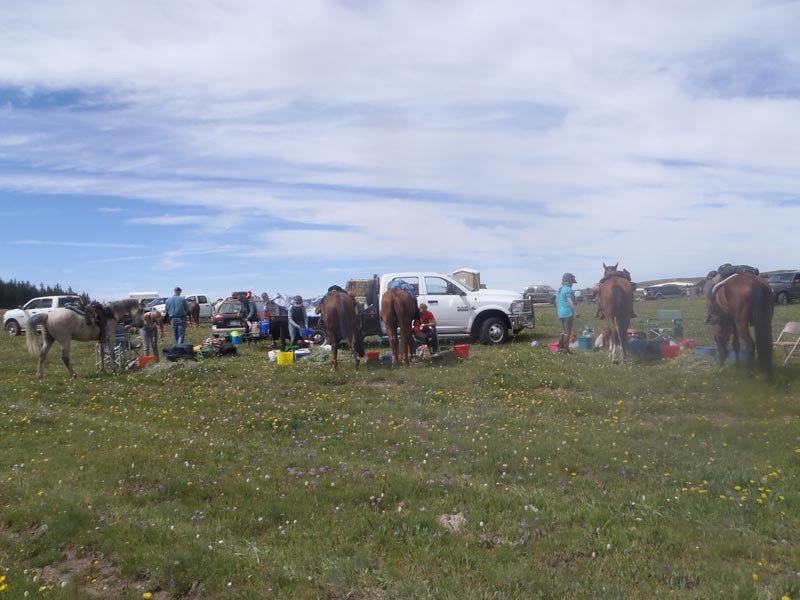 Shortly behind them Connie and Anne had finished, Yay!, and they arrived on the next trailer ride back in camp. Everybody fell into bed for a few hours until the sun was up and blazing at 7 AMish, at which time a very simple awards meeting was held, with not all the finishers not quite making it out of bed to attend. And so Idaho came and mostly conquered the Big Horn 100, with the inevitable after-effects. Coming down the mountain in the dark at 2 AM, Connie was thinking, "I'm never doing this ride again. I don't even know if I want to do endurance anymore." But, kinda like birthing a baby, after several cups of morning coffee (made by me, the Coffee Director), after the awards, and after more AIR CONDITIONING, a shower, and a fabulous Tom-cooked-with-endurance-love breakfast at Tom and Fawn's, Connie thought she just might come back and ride the Big Horn 100 next year. Hannah Johnson and her amazing one-eyed Kourageus Hope, aka Stuart, won the 100 - for the third time - and got Best Condition - for the second time. (Hannah also tied for first on the 50 on Friday!) 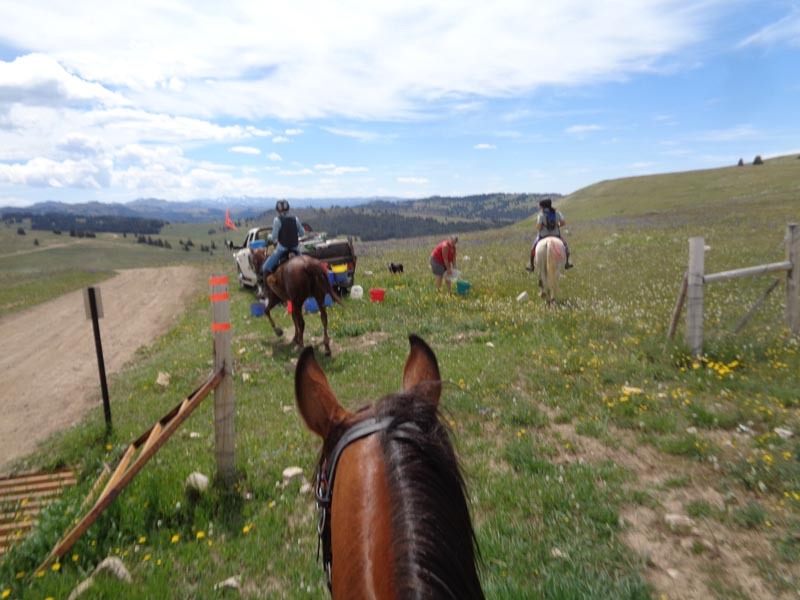 Hannah posted, "This horse gave me his heart and his complete trust this bighorn 100, the mountain humbled us and the loss of his eye proved to be a thing coming down the slick rock in the dark… We finished to a cheering crew and a crying rider…" 14 of the 18 starters finished. 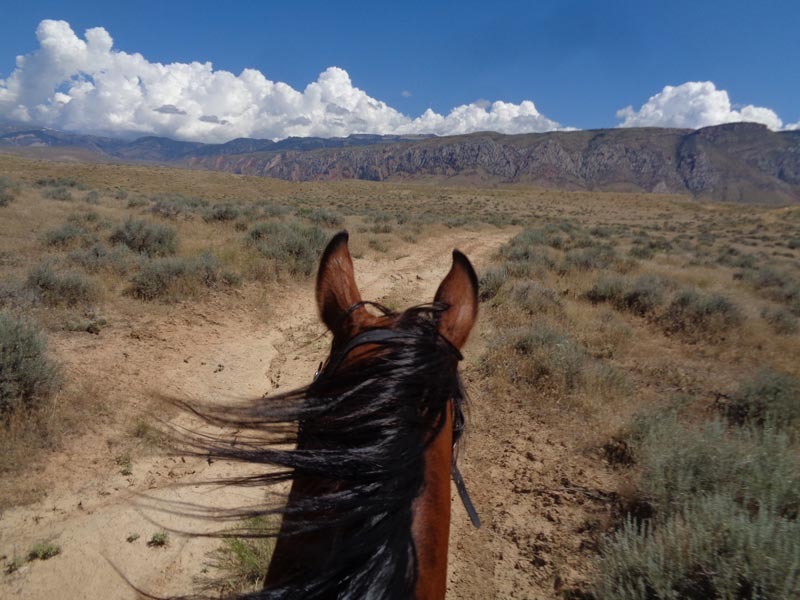 The Big Horn is in my top 3 of most beautiful rides (with Moab and Eastern High Sierra Classic), and in my top 3 of hardest rides (with Tevis and Virginia City), and - like any mountain ride - you come prepared with the right horse. Don't come if you are not fit - you won't be doing your horse any favors. Don't even bring a horse that's not fit. And there's no dinking around on this trail - prepare to ride. 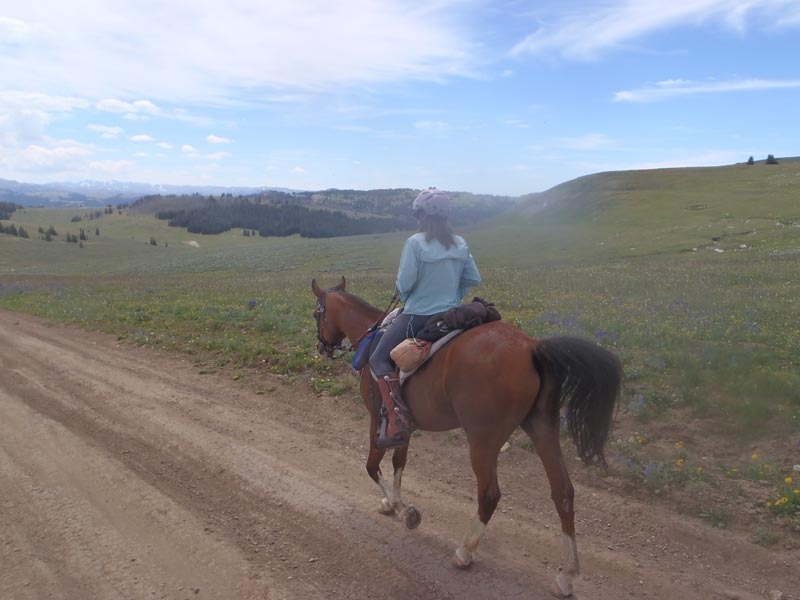 Bring the right gear, and be prepared to take care of yourself and your horse if anything happens, and you'll be ahead of the game, even if you don't finish the ride.